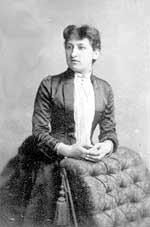 The activities of the Nieuw Malthusiaansche Bond took a more practical course when the first woman doctor in the Netherlands and a prominent feminist, Dr. Aletta H. Jacobs (1854-1929), who happened to be married to C.V. Gerritsen, started distributing contraceptives. She had noticed a publication on the development of the pessarium occlusivum by the German gynecologist Mensinga, and started a special consulting-hour in an Amsterdam working-class quarter. In her autobiography Jacobs mentions hostile reactions among her colleagues. Her dignified and concise defence of contraception did not convince the medical profession in the Netherlands, but did much to silence uninformed critique.